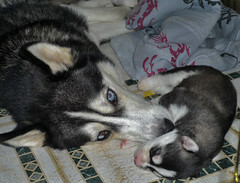 HTHNBR Foster Dogs Blog: The Pups' Eyes Have Opened! The Pups' Eyes Have Opened! The pups are growing and their eyes have opened! Lucy is a wonderful mother, and is just so proud of her babies. You can just see it in these photos! She has also been great about letting people handle her babies. Lucy is still underweight, and due to the worms she has, she has had trouble gaining any weight. She is nursing and has also had diarrhea in the past few days. The pups are now old enough that she can be wormed with Panacure, but she will also need to be treated for Lyme disease and spayed once she is healthy. Lucy's 7 pups will all need the usual puppy care and check ups, and will all need to be spayed or neutered and vaccinated before they are adopted. Would you like to sponsor a pup and make a donation toward a puppy's care? She's such a beaWOOtiful Mom! Tank woo fur saving her, saving them, and sharing ALL!